With all the BBQs, ice cream, and activities this summer, it’s easy to throw your body out of sync. With these five tips you can help maintain a well-balanced diet this summer. By starting out the day with a healthy breakfast full of fiber and protein, you set the tone for the whole day. Skipping breakfast can lead to an out-of-control appetite and cause you to eat too fast and consume too many calories. Eating breakfast can reduce hunger later in the day and help you to choose lower calorie foods at later meals. Sometimes when we think we are hungry, we are actually thirsty. Staying hydrated can serve as an appetite suppressant and help with weight loss. Our digestive system needs water to function properly so the more water you drink the more you flush out waste and bacteria. Fiber helps you feel full and consumer less calories which can help with all the summer splurging. Aim for about 30 grams of fiber per day and make at least half of your daily grains whole grains. It’s important to consume both Soluble and Insoluble Fiber in your diet because they work together. Soluble fiber keeps you feeling full without adding many calories to your diet, so it can help you manage your weight and prevent you from overeating. Insoluble fiber helps food pass through your digestive system more easily and aids in regulating bowel movements. 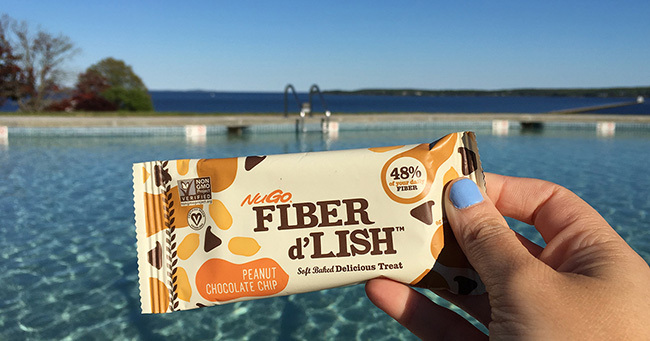 NuGo Fiber d’Lish is the only Fiber bar that combines natural whole grain oats with a perfect blend of soluble and insoluble fiber to promote natural regularity and curb hunger by slowing the absorption of fat and sugar into the bloodstream. While a healthy diet is important for maintaining a healthy lifestyle this summer, exercise is also necessary. Both diet and physical activity play a critical role in controlling your weight. Exercise boosts your mood, increases your energy levels, and combats health conditions. Whatever you decide to do, be consistent. To reap the benefits of exercise, just get more active throughout your day whether that means taking the stairs or going to the gym. Vegetables and fruits are an important part of a healthy diet. They provide many nutrients including potassium, dietary fiber, vitamin C, etc. Most are naturally low in fat and calories and are great for summer snacking. Every season features its own special fruits and vegetables, but summer offers an exceptional range of choices. Enjoy the fresh fruits and vegetables of the summer harvest by visiting your local farmers market! There are a lot of factors that go into a healthy lifestyle. By making these 5 relatively easy changes to your diet, you are setting yourself up for a healthier you this summer. Enjoy the abundance of fresh, delicious and healthy choices while you can and visit our store to make Fiber d’Lish a part of your new balanced diet! This entry was posted in Health Benefits of Fiber.